Increased insurance premium, among other factors, had an adverse effect on buyers leading to 10-15 per cent drop in two wheeler retail sales. 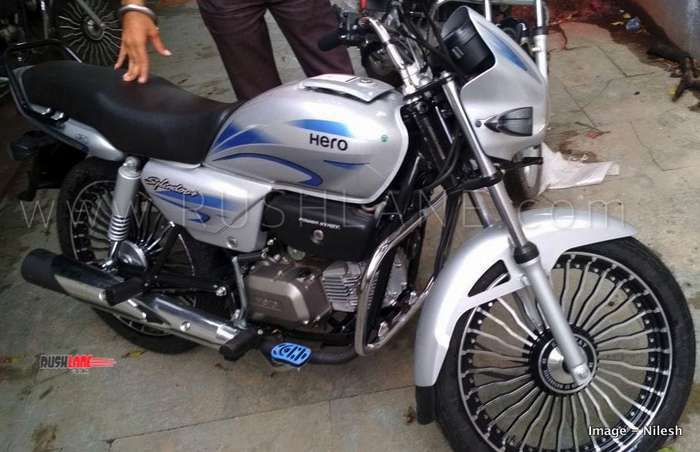 India’s best selling two wheeler – Hero Splendor with aftermarket alloys. While Hero MotoCorp and Honda Motorcycles and Scooters continued their rule in top two positions, Bajaj Auto has seen a dramatic increase in sales causing a notable increase in market share from 9.8 percent in FY18 to 12 percent in FY19. Lower consumer sentiments, rising fuel prices, liquidity crunch, higher interest rates and GST at a current rate of 28 percent, combined to have an adverse effect on two wheeler sales in India over the past financial year. Society of Indian Automobile Manufacturers (SIAM) revealed that two wheeler domestic sales grew 4.86 percent in FY19 to 2,181,390 units as compared to 20,200,117 units sold in the same period of the previous year. Hero MotoCorp and Honda Motorcycle and Scooter India, India’s two biggest two wheeler makers, were once again at the top of the list in terms of domestic sales. However, while Hero MotoCorp posted positive sales, sales of Honda dipped 4.41 percent in the past financial year. Hero MotoCorp sold a total of 7,612,775 units in FY19 as against 7,382,718 units in FY18, an increase of 3.12 percent. On the other hand sales of Honda dipped 4.41 percent from 5,775,287 units sold in FY18 to 5,520,617 sold in the past financial year. Honda is the only major two wheeler brand to have posted a decline in sales. For March 2019, their sales declined by 47%. In the third spot on the list, TVS Motors also noted an increase in sales by 9.08 percent from 2,875,466 units sold in FY18 to 3,136,532 units sold in FY19. The two and three wheeler maker also noted a 0.4 percent increase in its market share. Bajaj Auto Limited has posted a 28.7 percent increase in sales in FY19 over domestic sales in FY18 which increased from 1,974,577 units to 2,541,320 units. Market share also increased from 9.8 percent in FY18 to 12 percent in the past fiscal. Royal Enfield sales increased marginally from 801,229 units in FY18 to 805,273 units in FY19 while it was the same with India Yamaha Motors with a 1.5 percent increase in sales from 792,812 units in FY18 to 804,682 units in FY19. Sales of Japanese two-wheeler manufacturer Suzuki Motors increased substantially by 33.44 percent in the last fiscal to 668,787 units as against 501,203 units sold in the year ago period. The company owed this increase in sales to a well balanced product portfolio, both where scooters and motorcycles were concerned with the Access 125 continuing to be the highest grossing product for the company in India. Piaggio also saw sales increase 14.09 percent with sales in the past financial year at 77,775 units as against sales of 68,169 in the same period of the previous year. The company plans to scale up its networks in India to over 350 dealerships by the end of this year from a current 250 sales outlets. Piaggio has a manufacturing plant in Baramati in Maharashtra from where the iconic Vespa alongside Aprilia SR 150 are produced. Negative sales were reported by Mahindra Two Wheelers in FY19. Sales dipped to 4,004 units in the past financial year from 14,752 units in the same period of the previous year. Sales of India Kawasaki Motors increased 74.51 percent to 3,115 units in FY19 from 1,799 units in FY18. These figures took total sales of two wheelers up marginally by 4.86 percent from 20,200,117 units in FY18 to 21,181,390 in FY19 leading piling stocks and high inventory at most company dealerships in the country. Taking only motorcycles sales into account, sales grew by 7.7 percent in FY19 to 13,599,678 units from 12,620,690 units sold in FY18. 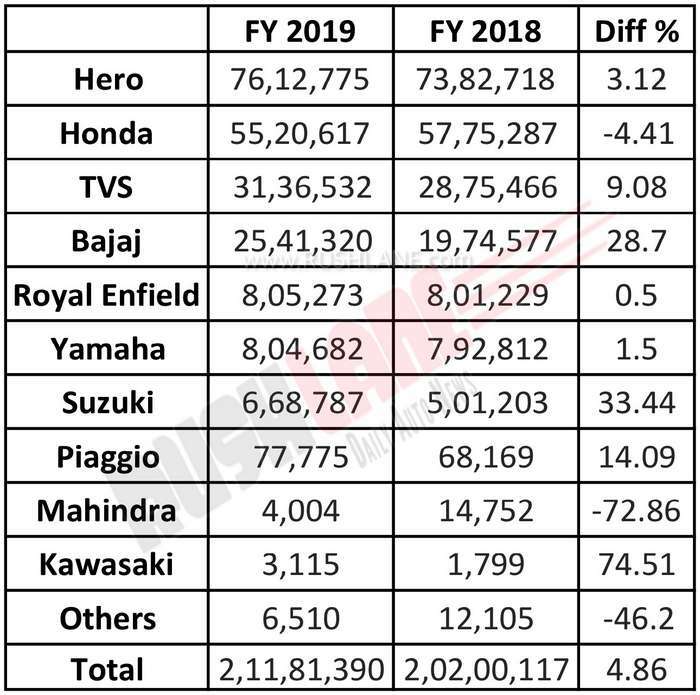 Hero MotoCorp was at the top of this list followed by Bajaj Auto while Honda was pushed into a third spot with a decline in sales from 1,953,745 units sold in FY18 to 1,840,214 units sold in the same period of the previous year. TVS sales also increased significantly from 916,776 units sold in FY18 to 1,014,923 units sold in FY19. Scooter sales dipped 25 percent in the past financial year with market share in the scooter segment being reduced from 33.27 percent in FY18 to 31.63 percent in FY19. Decline in scooter sales was the first in the past decade. Analysts claim this is due to increased ownership cost which has increased 10-12 percent in the past one year, leading to an adverse effect on the segment. As per SIAM, sales predictions for FY20 do not look very promising. The upcoming elections, switching over to higher safety and emission norms along with bleak forecasts for a below average monsoon could impact consumer demand both where sales of four and two wheelers are concerned.